Meet Mary Blanchard and Kathleen March. 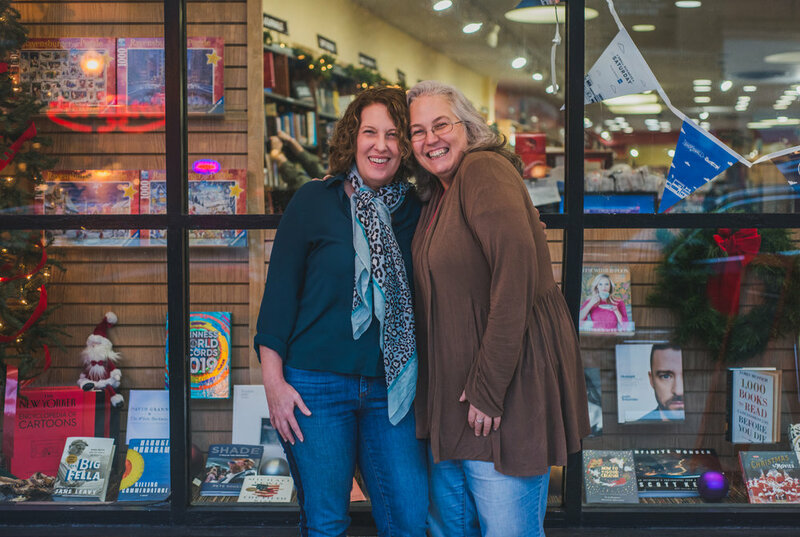 Mary and Kathleen started a program for local parents called Raising a Resilient Child at Anderson’s Bookstore in downtown Downers Grove, IL, where Kathleen is employed. The program, a free monthly meeting for parents with kids of all ages, features a new topic and speaker each month to give parents tools and resources to help their children grow in resilience and coping in these fast-paced and changing times. G: How did Raising A Resilient Child get started? K: It all started during the 2016 Election Campaign. The talk of the election was about the travel ban and banning Muslims, and the way that I cope with things that bother me in that way is to come into work and find books to educate our community about these issues. I found every possible book that I had and put it on display, and then worried that I might get fired, but I still felt good about it. Within a few hours, I had a Muslim-American woman come in and tell me how good it felt to come into our store and see herself and her son represented in the book display. The next day, another community member came in and commented in a positive way. It was at this time that I realized that you can take issues that are happening and use literature to educate and inform. It was then that the Raising a Global Citizen Program was born. M: Raising a Resilient Child morphed out of that first program. It was geared towards helping parents talk with their children about some of these tougher issues. At that time, as a country we were facing a refugee crisis. How do you talk to your kids about that? How do you teach your children about Islam in a positive light, rather than what we all hear about in the news? We all know that books and stories are ways to do that. At that time, Kathleen pulled all of what she could find in children’s literature so that parents could talk to their children about some of these issues and help broaden their children’s perspectives and their worlds. G: How to Raise a Global Citizen ran through the year of 2017. Then what happened? K: It had run its course and I felt we had covered just about every topic. It was tied to current events, and I felt there was still a need here and was trying to figure out what it was. It was then that I met Mary through being a customer here, and getting to know her and her son’s story, that I realized How to Raise A Resilient Child was going to be our next thing. M: My son was really struggling, and Kathleen and I started talking about what was going on in our community and what we were hearing from parents and others. It was around this time that there was another suicide completion at the high school and the librarian said that the library had been his safe haven. She realized the importance of having resources in the library for kids to help them. G: Mary, can you tell me more about your son’s story? M: My son Dylan struggled early on with school refusal, and some issues that manifested as physical symptoms. We never realized that it was anxiety. When he was in high school, he ended up with a misdiagnosed medial issue. There was trauma and stress that came out of dealing with it, and he had some classic symptoms of narcotic withdrawal from the pain medications his doctors put him on for surgery. He just slid deeper and deeper at that point with missing school, and struggling with these issues, and I didn’t know what to do or how to advocate for him. Within a year, he fell into anxiety and depression, and it was a long battle. It was an anxious time for me, and I wasn’t always getting great advice or direction. When he started to get better, he started to share his story, and I felt that if he was brave enough to share, then maybe I could be brave enough to share. And I felt that maybe I could help other parents going through something similar. G: That is such a desperate situation. That’s where the power of having resources and connection can really pull you through. K: It was around this time that we were having coffee and the idea of these issues were in the back of my head, and I just didn’t know what the next thing was. It was at that meeting that it all came together and I just told Mary, “I know what you need to do. You need to help me” and that was really the start of it all. M: We wanted to offer this monthly support for parents as a way to fight against the stigma of mental health. Fifty years ago, people wouldn't talk about cancer out loud, they would call it the “c word” or whisper it. Mental illness is the “cancer” of our time. We need to talk about it to annihilate stigma. At our first meeting we didn’t know what to expect, but we expected it to be small. We kept having to get more chairs for people coming in, and we were just bowled over with the response. K: We knew we wanted it to be a safe space where people would feel like they could open up and talk about some of these darker, harder things that are going on in their families, and we were so blown away not just by the response, but by how open and trusting people were. We had to keep getting boxes of tissues. G: What are some of the topics you have done? M: There have been several running themes that have continued to surface. We worked with Hope for the Day, the suicide prevention organization for the first presentation. We have talked about going back to school, friendships, and bullying. We have talked about building up resilience for kids with self-care, how to have quality face-to-face time as a family, and how to have a family value system and system of priorities. We feel that the only way to start changing the societal construct of treating our children's lives like commodities is if parents make that change from the ground up. Schools are reacting to demands of parents and will continue to until we change our priorities for our children. G: What has been the response from the participants in the group and in the community? K: I think the biggest response is “thank you”. While I knew on the surface what was going on with kids in our community, to see these parents who had no idea where to turn to leave with hope, with ideas and resources and feeling better, has been the biggest thing. M: What is really cool is to see parents come into the group and share ideas with each other. Every time someone says one thing, another parent offers something up. And this was really the idea, to create this community that could be there for one another and interact in that way. One of the members of our group that has come each month said recently that she always comes with an open mind and always leaves with something she never would have thought of. She mentioned that her son came home with a grade on his report card she didn't expect and she was able to temper her response because of the things we've been discussing each month. G: What do you see happening with Raising a Resilient Child in 2019? M: There are several topics that we haven’t covered, like college, sports for kids, and grieving. My son will be home from college on break this month is going to share his story and his experience, and I am hoping he can give parents some ideas in supporting their kids. K: Parents can even bring their kids this month to hear Dylan’s talk so that they can hear that they are not alone. In this day and age, where every family seems perfect on Instagram or Facebook, you can feel like a bad parent. This idea of not being alone in something has been a huge undercurrent in the work we are doing. G: I feel like you are filling such a void for our community. We are all here together. Our kids are all students in this community. We are all parents in this community. They say, “It takes a village”. This is our village, and we are all here for each other. What else can you share about the power of community, which is at the heart of this group and what is ahead? M: It’s about creating something that is allowing people to show up in person. We hope to hold new conversations about race. We need to talk about these things that are stigmatized and difficult to talk about that are fraying the fabric of our communities, ourselves and our country. K: Our focus in 2019 is going to be on our community through our stories. The one thing we all share together is our humanity and we express that through the stories of ourselves. When we forget that, when we forget to listen to those, that’s when division strikes. It’s the one thing we all have in common. The next meeting of Raising a Resilient Child will be held on December 13 at 6:30 pm. For more information go to andersonsbookshop.com. You can find out more about the group and follow along on Facebook at Raising a Resilient Child.